Read about my Asterope experience in the blog. I am concentrated on some new sound tools and some new audiences or clients in the past years. It has culminated to this point as “Gerber Sound Therapy”. Music that envelopes the listener in a blanket of sounds. Like a local church group who does an hour of in the moment music calling it “A Washing”… music that washes over you. 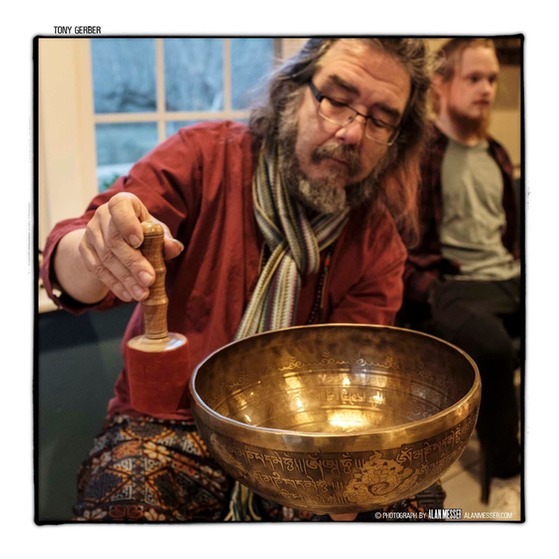 My project started with Massood Taj, called “Sacred Moments” has brought about a better way of describing the music we are doing “in the moment” on Sunday’s in Big East Fork Valley at the Center for Sustainable Stewardship Retreat, calling it “Sound Bathing.” Such a gentle chill, creating a sacred space for listening and thinking and even conversing. 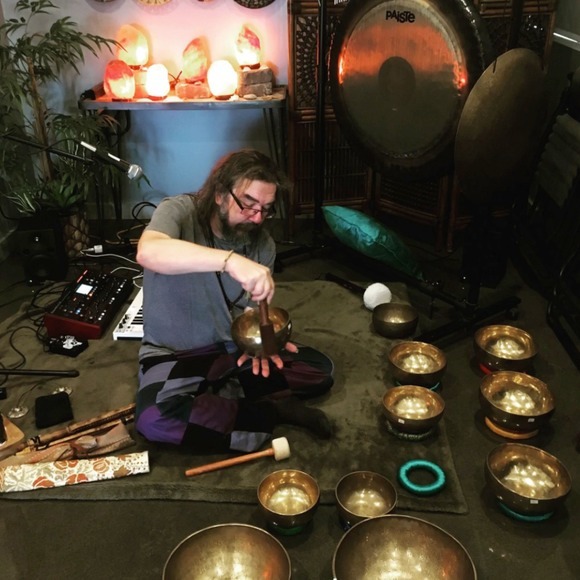 When we gather, a concentration on nature, music, art, food and an appreciation for each other is the spirit where our musical sound baths come to fruition creating the soundtrack to an environment of equalization and common denominators. 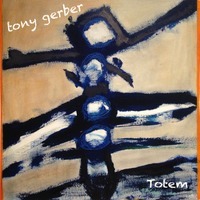 The sonic drones are like streams of water and gentle melodies floating in the sound bath that is a defining sound for Tony Gerber’s music and many of his projects. I am excited to announce the first performance with my father in law and friend, Seth Ritter, and our new sacred music project, yet to be named. The beginnings of this group and this first concert together using new instrumentation came together in that familiar feeling of everything is "suppose to be happening this way". Let me explain. About 2 weeks ago, there was a spiritual movie night at a local meditation/yoga/healing house here in Nashville that I received a Facebook invite to via my friend Scott, who was hosting the movie night with his wife. Come to find out, the lady who is the director of projects at the Ivy House was somebody that had recorded at my studio with Neal Merrick Blackwood in 1989 on Music Row, called, Space for Media. This movie night house, called the Ivy House, was actually built by the Collier family in the early 1900s, the same family that built Marathon Motorworks factory in downtown Nashville in 1907. I had a woodshop, paint studio, computer lab and recording studio at Marathon Village early in 1995, occupying the old Marathon Motorworks factory. The Collier family had kept the house until about 2004. Things were already feeling very much like it was suppose to be happening that day, that way. About a year ago, I got contacted by a young gentleman from Sweden named, Rickard Westman via the internet. He explained to me that he discovered my music via the internet and really liked what he heard. He explained that he had been developing a new video game with another gentleman by the name of Henri who was also from Sweden, but living in Tokyo, Japan. They had been using my music as the backdrop during their creative time spent creating graphics and coding for this new upcoming 4th person video game called, Pavilion. "Now," Rickard continued with me via Skype, "as we are assembling the game and it is operating closer to the beta stage, we cannot hear anything but your music to be used as the soundtrack for our game." He was wondering if we could create an agreement for the use of my music in their new game. After talking and examining the artwork, samples of gameplay and more, I was thoroughly excited to become part of the team for this unique video game that is NOT a shoot 'em up game, but much more contemplative, meditative and spiritual in it's overall image. This seemed to be a perfect match and intertwining of game elements and music. I can't remember when I first started thinking about the sensation when we are just playing our instrument, going with whatever comes to mind, we are in the moment of creation, the art of music. We may be a filter, we may be a conduit, we may be a creator or a mixture of sonic vibrancy. This is where the magic happens. It is also a grand treat for the audience to witness this momentary creation of music as well as a treat for the recorded media that catches the performance for others to hear. This is why I always have the tape machine running whenever I am recording with someone for the first time. It is those early moments of total unrestricted freshness of playing together that may produce the most magical music we catch for a project. If we were able to get back into the same exact head space each time we play, like that of the first time we collaborate with another musician, we would be able to extend the magic for years to come. In those rare instances, this is the case and we as musician/performers are able to return to a clear, fresh, open minded, naive, frame of mind to just let the music flow and let our inner musician flow with the music. That is the moment, between the flows. 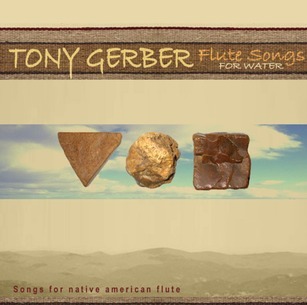 The best way in adult terms to describe my album "Flute Songs for Water" is like an "Audio Quaalude. "This solo album released in 2006, was a nightly ritual for my daughter for 3 years. When she went on to Montessori School I gave a copy to the head Montessori teacher for the kid's nap time as well as a couple other Montessori teachers who came through there but worked in other parts of town. The response back from the Montessori folks has been grateful and almost astounded that a music can affect the kids, "even kids who don't normally nap, nap when listening to your flute music." When my daughter went on to the Elementary School for Kindergarten I gave her teacher a copy of the same flute CD. She immediately started using it for the quiet time for her class with great comments back to me. I ran into to her the other day and she came up to me and was thanking me so much again for the flute music that she still uses everyday for the kids. She even said special needs also really responded well to the music. In the context of falling asleep, this music works. It is a total and rapid, calming of the now. "Calming of the Now" will be an upcoming release of this most useful music as an aid in sleeping and the most needed nap time for the children. Preschool teachers will be very, very thankful for this easy fix for a complete and peaceful nap time. Another year clicks by and I don't feel any older. Well, there are those little physical things. But that inner child is still the same. Still making music. Still wanting to learn more. I have been intrigued by the sound of the Wavedrum. Basically, a percussion synthesizer. I have the urge to move more, playing rhythms to my space music. The Wavedrum is a stereo device. One channel has the piezo electric pickups that drum uses to hear the sound of the mallets, sticks, hands, whatever is smacking the head or rim of the drum. It mixes that signal with the sounds of the Wavedrum. I am also looking at single, small, stereo looper to hook the Wavedrum into as a means to loop the rhythms on the fly as I use it for my live broadcasts. I get it started, let it go and move on to another instrument, many times looping it as well. Building the musical expressions as I go. In the moment, where I strive to be as much as possible. All the time, really. It is where it all happens. In the moment. Listen for some percussive/drum based instrumentation in my upcoming broadcasts and releases. I know I will be enjoying it. Below is a track that I recorded during my Ambient Sunday night broadcasts. I am playing the WaveDrum along with my synths in this song. 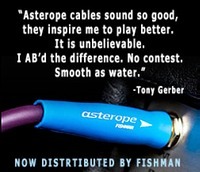 Asterope Audio Cables, Fishman Fluency Pickups, Woodsounds Flutes by Brent Haines and Odell Borg Flutes.